Bollywood dance unites Hindi-inspired choreography, music, and costumes with modern dance moves in a flamboyant performance. From the music to the moves, Bollywood dance is unmistakable and gaining in popularity. Dance lessons will generally focus on developing a choreographed routine to music made famous by the Bollywood film industry of South Asia. 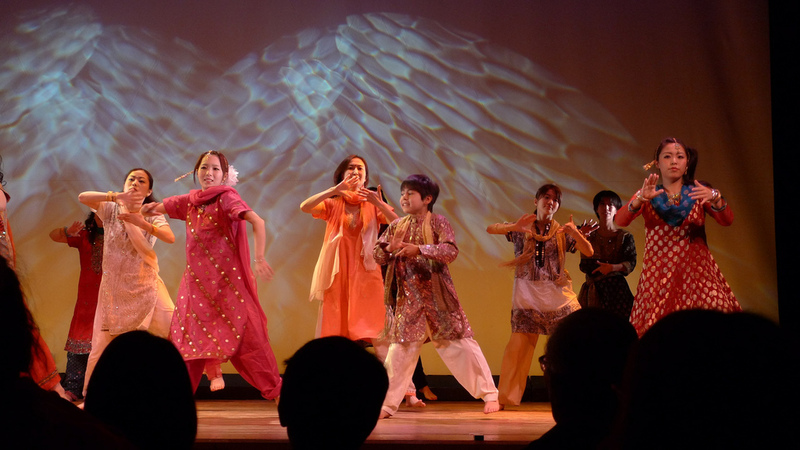 Women, men, and children can enroll in Bollywood dance classes. Expect a good workout, and wear comfortable clothing. In Dubai, a lot of dance studios provide the choreography for routines, and they even have dance troupes to perform at special events and corporate occasions. A Bollywood-inspired dance is often performed at a traditional pre-wedding Mehndi night and at a Sangeet (wedding) party. Whether for an imminent occasion or not, people in Dubai take Bollywood dance classes just for the fun of it! Bollywood dance routines adapt to time and place, thus enhancing the appeal of the genre to both young and old. People of different nationalities enjoy Bollywood dance classes, and at the very least, joining a class will be an exciting way to get in shape and dance off your worries. Look for a Bollywood dance instructor who is passionate about the genre, and truly enjoys bringing out the best in his or her budding star. Bring along your friends or family in order to work together on a choreographed routine. Meghna Naidu Dance Academy in Karama is run by an established Telugu and Hindi actress. She wants to share her passion for Bollywood dance with Dubai’s Indian and expatriate community. Meghna Naidu appeared in the famous dance video, “Kaliyon Ka Chaman,” as well as many Bollywood films. This is a studio that understands Bollywood film and dance sequences have become more mainstream. It is a good studio to learn the basics from a star. The dance studio is in Karama, and offers lessons and event dances for Sangeet and Mehendi functions, as well as school shows, anniversaries, and other special functions. Nisha Dance Centre offers Bollywood dance classes at different locations in Dubai, including DUTAC at the Mall of the Emirates and Burjuman Community hall. The philosophy of the centre is to break down barriers by offering dance classes that are appropriate for all levels. The centre also provides classes for schools and gatherings, and has a dance troupe that can perform at functions. Bollywood dance classes at the Nisha Dance Centre include a warm up to focus on strength and flexibility. The warm up leads on to faster-paced Bollywood routines. Expect a high-energy work out that changes each week, incorporating Indian folk dance and Bhangra dance. The lessons are appropriate for children over 6 and adults. Comfortable gym clothing should be worn. Off the Hook Dance Club in Ballet Centre, Jumeira 1, offers Bollywood dance classes for all ages. It is run by Ali Shabbir, a dance enthusiast from Dubai who choreographs Bollywood and Bhangra routines. His routines are built around the skills and ability of the dance students, and he teaches both children and adults. Fun and active classes are lead by inspirational instructors. The group sessions at Off the Hook Dance Club are tailored to the needs of the students, and appropriate for those with previous dance experience, as well as newbies. The idea behind Bollywood dance is to get as many involved in the dance as possible, while learning a new skill, like how to dance Bhangra. The beat is lively, and arranging a dance party for a group of friends can be a fun and motivational way to learn this new skill. Ocean Kids Dubai provides lessons that include a mix of Bollywood, Western, Hip Hop, and Funk. Their studios are located in Karama and Qusais, and the company also offers dance day camps during holidays. As with other institutes, expect that the choreography will depend on your previous experience, skill, and flexibility. Kairali Kalakendram, founded by classical Indian dancer Asha Sharath, has three locations in Dubai: Qusais, Karama, and Discovery Gardens. It also has a branch in neighbouring Sharjah. Operating for over twelve years in Dubai, Kairali Kalakendram is dedicated to exploring Indian heritage through art, music, and culture. To this end, it offers Bollywood dance classes that will help students perfect their dance techniques. Once you start Bollywood dance classes, expect the music to be loud with a strong tempo and beat. During performances, costumes will be added, and these run the gamut from traditional to western-inspired. If veering to the more traditional Indian costume, think matching outfits that are bright and colourful, with added embroidery, jewelry, and bangles for women. Women’s costumes may also include a veil, called a dupatta. Men traditionally wear a sherwani or kurta pajamas, although the Bollywood “look” is continuously evolving. Bollywood dance can incorporate elements of belly dance, Latin moves, Western Jazz, and Indian folk dance. Stylistically, the dance can be playful, romantic, or energetic. In Bollywood films, the dancing is not always integral to the storyline, so it is really a fun, expressive dance. The cost of taking Bollywood dance classes will be upwards of 70 Dirhams per lesson (around 20.00 USD per class). Most studios will have group packages. There are private lessons available, but naturally the one-on-one lessons carry a higher price tag. If you plan a dance for a wedding or event, you may be able to negotiate your price at the dance centre. Do you want to try out your new dance moves? Club Boudoir at the Dubai Marine Beach Resort and Spa offers a decidedly upscale venue for its Saturday night Deja Vu Bollywood night. Karama this is not! Expect Desi, a fusion of Indian and Western music, by DJ Hani. In Dubai, the party stretches until 3AM, so you’ll notice that the crowds don’t arrive until around 10 or 11PM. Dress code is decidedly smart, fashionable, and upscale. There are Bollywood dance clubs and lounges in Karama, where you can show off your moves. Some are seedier than others, so take care when you are looking for a place to dance Bollywood-style.